CURT DANHAUSER finally releases the last part of “PTOLEMY WEPT”! There are few fans in the world (if any) who are more expert in and dedicated to the animated Star Trek series than Curt Danhauser. For more than two decades, his website has been an amazing treasure trove of resources and background information for fans of that beloved 1970s series from Filmation. Back in 2008, Curt went where no fan had gone before and released a brand new, 7-minute animated Star Trek episode short that he produced himself entitled “The Element of Surprise.” Later that year, Curt released the first part of another, longer-length (28 minutes) animated episode, “And Let the Heavens Fall,” which he finished up early in 2009. 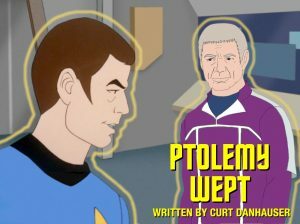 And then in 2011, Curt embarked on his most ambitious project yet, “Ptolemy Wept,” which would end up being 66 minutes long and take more than five years to finish! You can watch the full episode (all nine parts) on this web page. The episode is a sequel of sorts to two third season TOS episodes: “Spock’s Brain” and “Requiem for Methuselah.” And thankfully, we don’t see the Morg or Eymorg. But we do see Flint, who plays a major role in the episode, which is made much more interesting from his presence. I won’t spoil any more from the story, as it’s definitely worth checking out. It starts a little slowly before becoming an episode that feels, in story at least, very similar to something that might very well have happened in an episode of TOS or TNG. You do have to get past the voices, though. Curt provided nearly all of the character dialog himself, and while he tries very hard to imitate Kirk, Spock, McCoy, Scotty, Suly, and even M’Ress and Arex, if you’re looking for an exact match to the original actors, you’ll be disappointed. For me, for most fan films I view, I always adjust the setting on my expectation-o-meter to allow for “trying really hard”…which Curt certainly did. And even though it took five years from 2011 to 2016 for Curt to release the final part, in the end, it was worth the wait, and the hour-long animated episode is something to be very proud of.